Hospice doesn’t just treat the patient, it provides care for the caregiver as well. The choice to elect hospice is an emotional one. 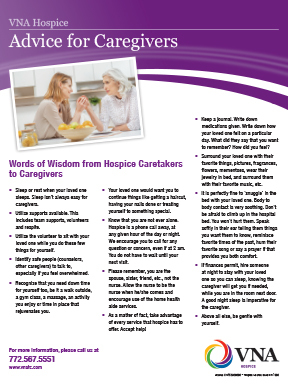 Being a caregiver for someone receiving hospice may not be something you ever expected to do. But hospice is unique because it doesn’t provide care just for the patient. Because being a hospice caregiver is an important role, hospice provides services specifically for the caregiver. Being a hospice caregiver means that you will have the support you need while you are on this hospice journey with your loved one. After the passing of a loved one, hospice is still available to help. Hospice counselors remain in touch with family members for 13 months after the hospice patient passes. Through one-on-one counseling, support groups and community remembrance events, hospice cares for the family caregiver and wants to help him or her through their grief. Caregivers can use these support services as they need them to navigate this emotional journey.